accidental release of SCBA air cylinder, while providing immediate access when needed. NFPA 1901-09 Sections 15-5.5 and 15-5.6 require restraint straps for plastic SCBA air cylinder storage racks. 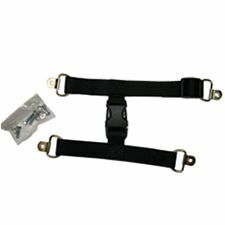 The straps are designed to keep the air cylinder in place in the event of an accident or roll-over. The strap assembly bolts into place utilizing the four corner mounting holes. Order with new storage racks or retrofit onto existing units. Use with model PACSR storage racks.